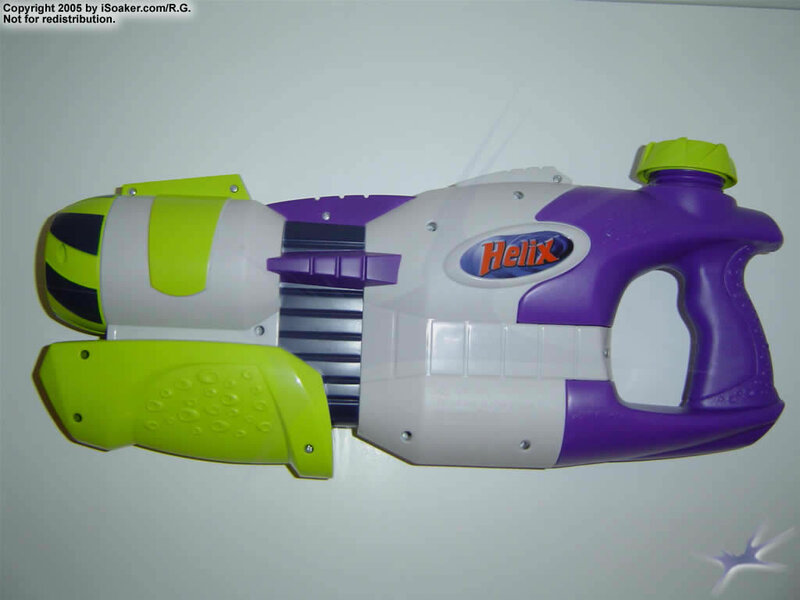 The Super Soaker Helix is a Power Soaker with pluses! Unlike the smaller Power Soakers, the Helix has its own reservoir that holds a respectable amount of water. The body construction feels quite solid and the back-side handle is quite comfortable to hold. The reservoir features a Fast-Fill cap meaning that with a decent pressure water stream (i.e. from an average garden hose), one can fill the reservoir without needing to remove the cap completely. However, water will not spill out from the reservoir after. The cap, while it can be fully removed in case the fast-fill does not work, does not have a tether. The Helix derives its name from the helix of water its dual nozzles produce. Basically, extending the pump fills the pump-piston with water. Pulling the pump pushes water out of the dual nozzles while, at the same time, rotating them clockwise yielding what appears to be dual twisting streams of water. On top of this, the angle of the nozzles can be easily adjusted by turning the dial at the very front of the blaster (the stripped area at the front rotates 360 degrees around). Rotating this dial toggles the dual nozzles from narrow to wide angles. Due to the spinning nature of the streams produced, the resulting blast leaves amusing circular water patterns. What this also means is that if one tilts the blaster even only slightly while shooting, the area that would be covered by water is greater than any single-nozzled blaster, but more concentrated than any fan-blast. The overall effect of the dual streams is reminiscent of a riot-blast as could be done on earlier XP models, but much more controlled. Being piston-based, the range of the streams are dependant on how forcefully one is able to pull the pump. However, as the Helix does not need to be pressurized, it means instant soaking action on demand as each pump pushes a respectable amount of water. 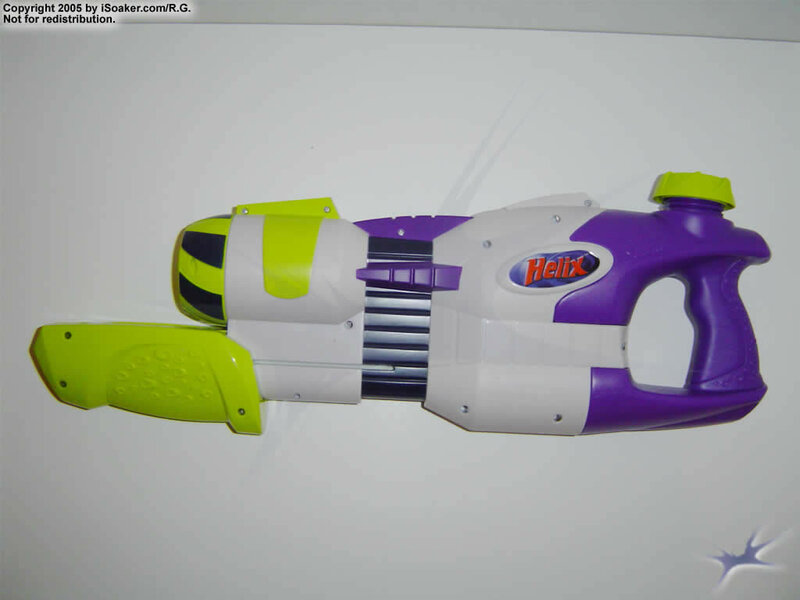 Note: in 2006, a Max-Infusion variant of the Super Soaker Helix was released. 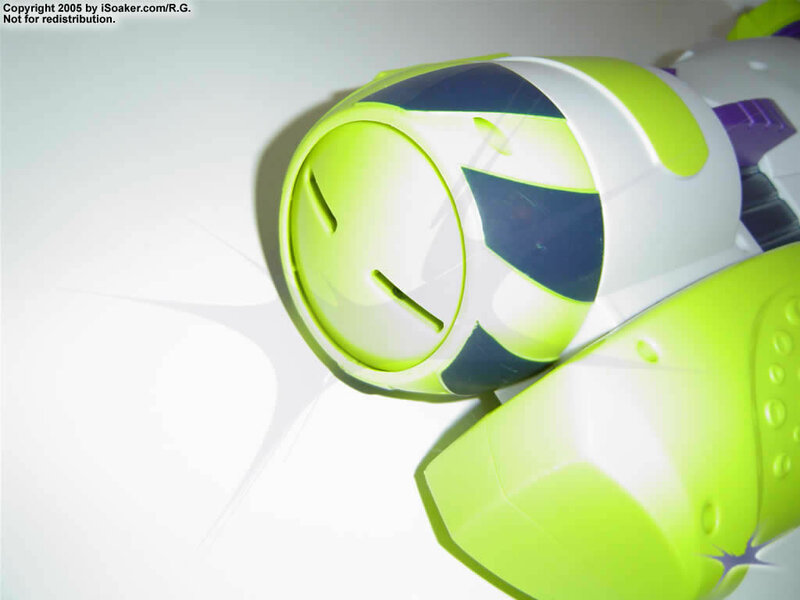 The Super Soaker Max-Infusion Helix is identical in design to the original Super Soaker Helix, but its reservoir cap was enlargened and modified such that it could be attached to the Super Soaker Max-Infusion Aquapack reservoirs. Respectable amount of water unleashed per pump. Piston-based design means no pre-pumping required to build enough pressure to shoot. Spinning nozzles produce a spiralling stream that soaks larger areas very quickly. Nozzles' angle easily adjustable simply by turning the forward-placed dial. Can be fast-filled from a hose without needing to remove the reservoir cap. Piston-based system means soaker cannot be fired continuously. Narrowest nozzle setting not exactly straight, thus streams still spread apart. Lack of strap means that a bag or backpack is required if one wants to use this as a back-up blaster. I had one of these back in 2005 when it was just out and to be honest never really liked it. For one the range was poor even for a 10 a year old kid second the gimic of "more water" was just that... a gimic 19 shots per refill even a CPS 2000 can last longer tap shooting. Then there was the rotating nozzle which had a habit of not rotating, and a pump that just kept on jaming over and over again and it all this adds up to my least favorite blaster ever. The bright side if there was one was that it was very durable it lasted till 2010 when the pump finally became immobilized.